What does that weird head stamp mean on that old bullet? 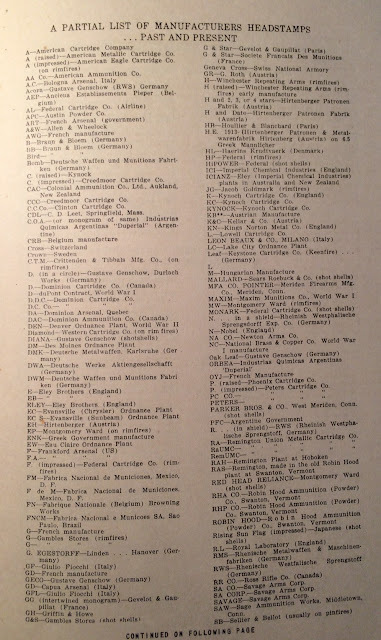 Hopefully this compilation list of Manufacturers Marks will help. A A ( raised ) —American Metallic Eagle Cartridge Cartridge co.Co. 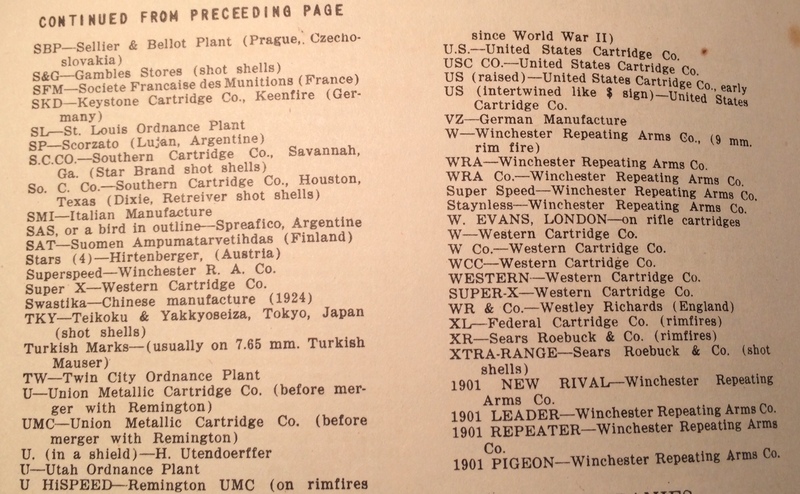 C. (impressed ) -—Creedmoor Cartridge Co.
CCC—-Creedmoor cartridge Co. e Co.—Clinton Cartridge Co.
CDW—C. I), Leet, Springfield, Mass. 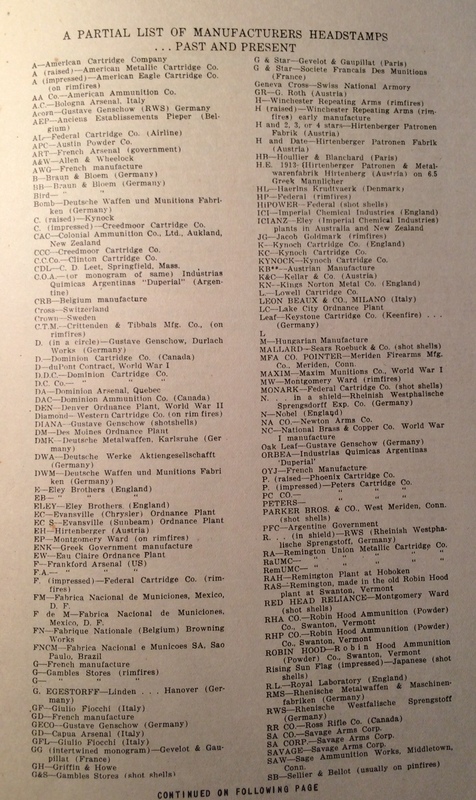 F de M—Fabrica Nacional de Municiones, Mexico, D. F.
JG—Jacob Goldmark (rimfires) K—Kynoch Cartridge Co. (England) KC—-Kynoch Cartridge Co.
& Co. (Austria) KN—-Kings Norton Metal Co. (England) L.—-Lowell Cartridge Co.
MFA CO. POINTER—Meriden Firearms Mfg. 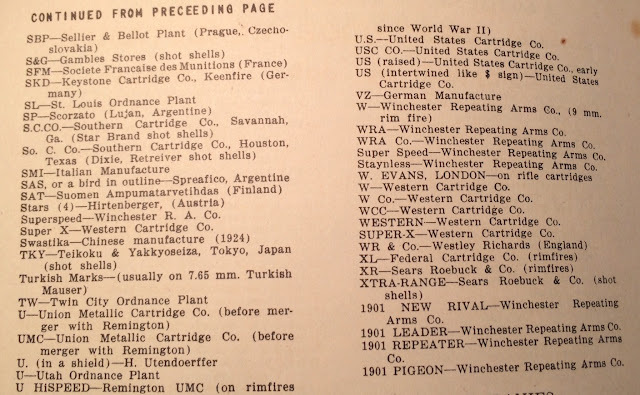 Co., Meriden, Conn.
'Duperial' OYJ—French Manufacture, P. (raised—Phoenix Cartridge Co.
PARKER BROS. & CO., West Meriden, Conn.
RA—Remington Union Metallic Cartridge Co.
RR CO.—Ross Rifle co. (Canada) SA CO.—Savage Arms Corp.
SAW—Sage Ammunition Works, Middletown, Conn.
SAT—-Suomen Ampumatarvetihdas (Finland) Stars (4)—Hirtenberger, (Austria) Superspeed—Winchester R. A. Co.
WRA Co.—Winchester Repeating Arms Co.
Super Speed—Winchester Repeating Arms Co.
Staynless—Winchester Repeating Arms Co. W. EVANS, LONDON--on rifle cartridges W—-Western Cartridge Co.
1901 NEW RIVAL—Winchester Repeating Arms Co.
1901 LEADER—Winchester Repeating Arms co.
1901 REPEATER—Winchester Repeating Arms co.
1901 PIGEON—Winchester Repeating Arms Co.